The Toronto Mural Archive Exhibit tour will be making its final stop this year in Etobicoke, at The Storefront Gallery at Arts Etobicoke, from August 20th to September 25th*, and will be open to the public weekdays from 10 am to 4 pm. 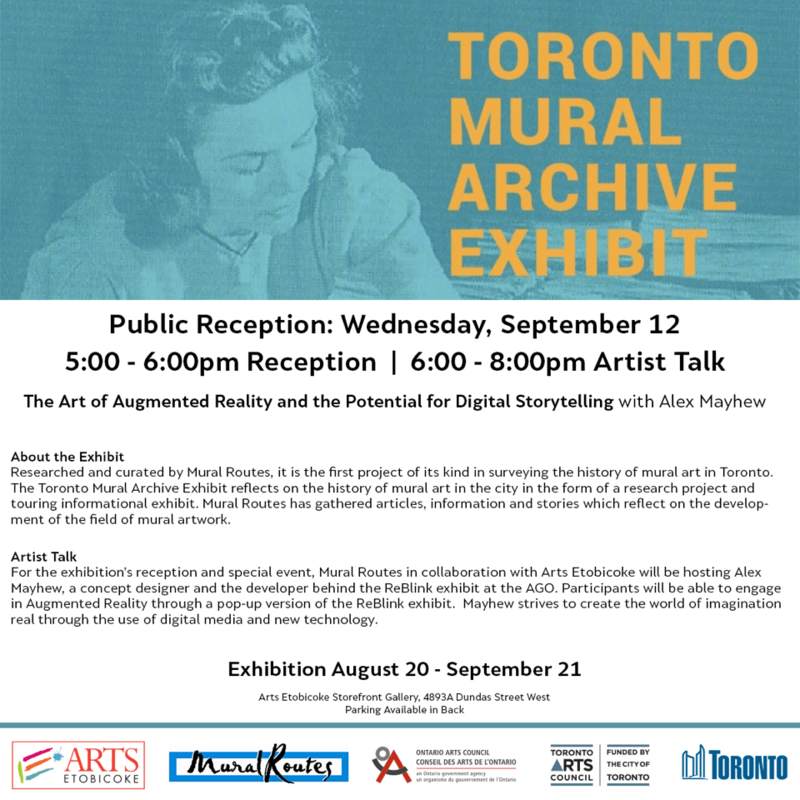 For the exhibition’s reception and special event, Mural Routes in collaboration with Arts Etobicoke will be hosting Alex Mayhew, a concept designer and developer, to discuss the potential of the relationship between murals and technology. Mayhew strives to create the world of imagination real through the use of digital media and new technology. Photo courtesy of Alex Mayhew, featuring Reblink, an augmented reality show at The Art Gallery of Ontario, 2017. For two decades, Mayhew has worked across multiple platforms using cutting edge digital media to create iconic, engaging, and effective projects. Alongside Ian Kelso, Mayhew co-founded a mixed reality company called Impossible Things. 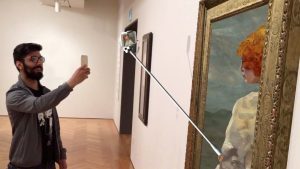 Their first project, Reblink, an augmented reality show that refreshes and re-imagines the traditional gallery view experience, was launched in 2017 at the Art Gallery of Ontario and has garnered significant international attention from press and industry winning 2018 American Alliance of Museums top Muse Award for augmented reality. 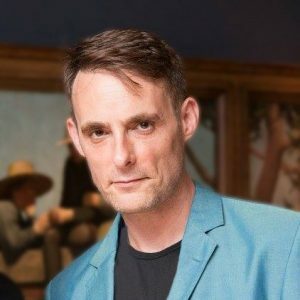 As a concept designer, developer, producer, and team leader, Mayhew has established himself as an internationally-renowned creator of highly innovative and emotionally compelling experiences working with clients including Peter Gabriel, Xenophile Media, Massachusetts Institute of Technology, and the Royal Shakespeare Company. Click here for more on Alex Mayhew and his work. Researched and curated by Mural Routes, it is the first project its kind in surveying the history of mural art in Toronto. The Toronto Mural Archive Exhibit reflects on the history of mural art in the city in the form of a research project and touring informational exhibit. Mural Routes has gathered articles, information and stories which reflect on the development of the field of mural artwork. We have combined our research together to share ‘the story’ of murals in Toronto in a touring exhibit. The archive provides context to both critically reflect and inspire the future mural art movement in Toronto, and to provide a template for other cities to follow. Found at Art Etobicoke, the Storefront Gallery is a dedicated space for contemporary art, with emphasis on highlighting artists in connection with the Etobicoke community. More information about Arts Etobicoke and the Storefront Gallery can be found here. Special Thanks to our Partners: The Toronto Mural Archive is generously supported by the Ontario Arts Council, an agency of the Government of Ontario. We greatly appreciate the support of our touring exhibition partners: Scarborough Arts, The Downtown Yonge BIA, Urbanspace Gallery, and Arts Etobicoke.